Philippians 4:4 - Rejoice in the Lord alway: [and] again I say, Rejoice. 2 Corinthians 7:4 - Great [is] my boldness of speech toward you, great [is] my glorying of you: I am filled with comfort, I am exceeding joyful in all our tribulation. Romans 14:17 - For the kingdom of God is not meat and drink; but righteousness, and peace, and joy in the Holy Ghost. Psalms 16:9 - Therefore my heart is glad, and my glory rejoiceth: my flesh also shall rest in hope. 2 Corinthians 8:2 - How that in a great trial of affliction the abundance of their joy and their deep poverty abounded unto the riches of their liberality. 1 Peter 4:13 - But rejoice, inasmuch as ye are partakers of Christ's sufferings; that, when his glory shall be revealed, ye may be glad also with exceeding joy. Psalms 4:7 - Thou hast put gladness in my heart, more than in the time [that] their corn and their wine increased. 1 John 1:4 - And these things write we unto you, that your joy may be full. 1 Thessalonians 2:20 - For ye are our glory and joy. 2 Corinthians 1:24 - Not for that we have dominion over your faith, but are helpers of your joy: for by faith ye stand. Isaiah 55:12 - For ye shall go out with joy, and be led forth with peace: the mountains and the hills shall break forth before you into singing, and all the trees of the field shall clap [their] hands. Ezra 6:22 - And kept the feast of unleavened bread seven days with joy: for the LORD had made them joyful, and turned the heart of the king of Assyria unto them, to strengthen their hands in the work of the house of God, the God of Israel. Psalms 100:1 - (A Psalm of praise.) Make a joyful noise unto the LORD, all ye lands. Psalms 30:5 - For his anger [endureth but] a moment; in his favour [is] life: weeping may endure for a night, but joy [cometh] in the morning. 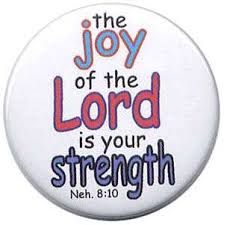 Nehemiah 12:43 - Also that day they offered great sacrifices, and rejoiced: for God had made them rejoice with great joy: the wives also and the children rejoiced: so that the joy of Jerusalem was heard even afar off. Nehemiah 8:9-18 - And Nehemiah, which [is] the Tirshatha, and Ezra the priest the scribe, and the Levites that taught the people, said unto all the people, This day [is] holy unto the LORD your God; mourn not, nor weep. For all the people wept, when they heard the words of the law. Matthew 2:10 - When they saw the star, they rejoiced with exceeding great joy. Psalms 126:6 - He that goeth forth and weepeth, bearing precious seed, shall doubtless come again with rejoicing, bringing his sheaves [with him]. Acts 16:25 - And at midnight Paul and Silas prayed, and sang praises unto God: and the prisoners heard them. John 17:13 - And now come I to thee; and these things I speak in the world, that they might have my joy fulfilled in themselves. Luke 1:47 - And my spirit hath rejoiced in God my Saviour. Psalms 118:24 - This [is] the day [which] the LORD hath made; we will rejoice and be glad in it. Psalms 70:4 - Let all those that seek thee rejoice and be glad in thee: and let such as love thy salvation say continually, Let God be magnified. Philemon 1:7 - For we have great joy and consolation in thy love, because the bowels of the saints are refreshed by thee, brother. Acts 8:8 - And there was great joy in that city. Acts 2:28 - Thou hast made known to me the ways of life; thou shalt make me full of joy with thy countenance. Jeremiah 33:6 - Behold, I will bring it health and cure, and I will cure them, and will reveal unto them the abundance of peace and truth. Ecclesiastes 11:8 - But if a man live many years, [and] rejoice in them all; yet let him remember the days of darkness; for they shall be many. All that cometh [is] vanity. Acts 3:8 - And he leaping up stood, and walked, and entered with them into the temple, walking, and leaping, and praising God. Ecclesiastes 11:9 - Rejoice, O young man, in thy youth; and let thy heart cheer thee in the days of thy youth, and walk in the ways of thine heart, and in the sight of thine eyes: but know thou, that for all these [things] God will bring thee into judgment. Psalms 119:127 - Therefore I love thy commandments above gold; yea, above fine gold. Psalms 69:32 - The humble shall see [this, and] be glad: and your heart shall live that seek God. 2 John 1:12 - Having many things to write unto you, I would not [write] with paper and ink: but I trust to come unto you, and speak face to face, that our joy may be full. Acts 16:34 - And when he had brought them into his house, he set meat before them, and rejoiced, believing in God with all his house. Matthew 25:21 - His lord said unto him, Well done, [thou] good and faithful servant: thou hast been faithful over a few things, I will make thee ruler over many things: enter thou into the joy of thy lord. Zechariah 2:10 - Sing and rejoice, O daughter of Zion: for, lo, I come, and I will dwell in the midst of thee, saith the LORD. Jeremiah 32:41 - Yea, I will rejoice over them to do them good, and I will plant them in this land assuredly with my whole heart and with my whole soul. Isaiah 61:10 - I will greatly rejoice in the LORD, my soul shall be joyful in my God; for he hath clothed me with the garments of salvation, he hath covered me with the robe of righteousness, as a bridegroom decketh [himself] with ornaments, and as a bride adorneth [herself] with her jewels. Isaiah 52:9 - Break forth into joy, sing together, ye waste places of Jerusalem: for the LORD hath comforted his people, he hath redeemed Jerusalem. Isaiah 30:29 - Ye shall have a song, as in the night [when] a holy solemnity is kept; and gladness of heart, as when one goeth with a pipe to come into the mountain of the LORD, to the mighty One of Israel. Isaiah 29:19 - The meek also shall increase [their] joy in the LORD, and the poor among men shall rejoice in the Holy One of Israel. Ecclesiastes 2:26 - For [God] giveth to a man that [is] good in his sight wisdom, and knowledge, and joy: but to the sinner he giveth travail, to gather and to heap up, that he may give to [him that is] good before God. This also [is] vanity and vexation of spirit. Proverbs 19:23 - The fear of the LORD [tendeth] to life: and [he that hath it] shall abide satisfied; he shall not be visited with evil. Psalms 104:34 - My meditation of him shall be sweet: I will be glad in the LORD. Psalms 100:2 - Serve the LORD with gladness: come before his presence with singing. Psalms 71:23 - My lips shall greatly rejoice when I sing unto thee; and my soul, which thou hast redeemed. Psalms 64:10 - The righteous shall be glad in the LORD, and shall trust in him; and all the upright in heart shall glory. Psalms 42:4 - When I remember these [things], I pour out my soul in me: for I had gone with the multitude, I went with them to the house of God, with the voice of joy and praise, with a multitude that kept holyday. Psalms 19:8 - The statutes of the LORD [are] right, rejoicing the heart: the commandment of the LORD [is] pure, enlightening the eyes. Psalms 16:11 - Thou wilt shew me the path of life: in thy presence [is] fulness of joy; at thy right hand [there are] pleasures for evermore. Psalms 14:7 - Oh that the salvation of Israel [were come] out of Zion! when the LORD bringeth back the captivity of his people, Jacob shall rejoice, [and] Israel shall be glad. 1 Thessalonians 2:19 - For what [is] our hope, or joy, or crown of rejoicing? [Are] not even ye in the presence of our Lord Jesus Christ at his coming? 2 Corinthians 12:10 - Therefore I take pleasure in infirmities, in reproaches, in necessities, in persecutions, in distresses for Christ's sake: for when I am weak, then am I strong. 2 Corinthians 7:13 - Therefore we were comforted in your comfort: yea, and exceedingly the more joyed we for the joy of Titus, because his spirit was refreshed by you all. 2 Corinthians 6:10 - As sorrowful, yet alway rejoicing; as poor, yet making many rich; as having nothing, and [yet] possessing all things. 2 Corinthians 2:3 - And I wrote this same unto you, lest, when I came, I should have sorrow from them of whom I ought to rejoice; having confidence in you all, that my joy is [the joy] of you all. 1 Corinthians 16:18 - For they have refreshed my spirit and yours: therefore acknowledge ye them that are such. Acts 13:52 - And the disciples were filled with joy, and with the Holy Ghost. Isaiah 44:23 - Sing, O ye heavens; for the LORD hath done [it]: shout, ye lower parts of the earth: break forth into singing, ye mountains, O forest, and every tree therein: for the LORD hath redeemed Jacob, and glorified himself in Israel.